We know that in cases of maximizing warehouse space, the typical advice is to ‘look up’. And with good reason—vertical storage like pallet racks and bulk storage racks is a fast and efficient way to help store more products and keep everything a little tidier without having to move into a bigger warehouse or add a bunch of extra storage in areas where space may be tight. However, much like any other storage needs, using your vertical space will still require a degree of foresight and planning in order to help them work as effectively as possible. 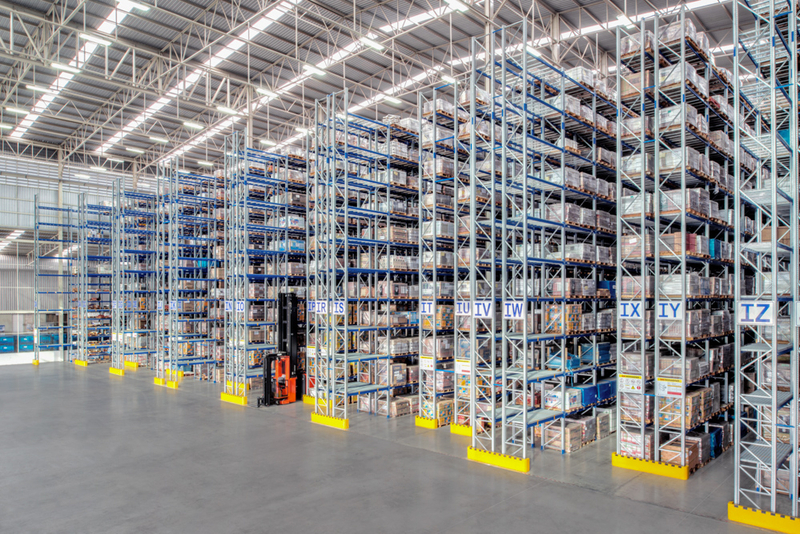 Learning how to better manage vertical storage will help reduce a number of headaches you may encounter while planning your warehouse, and could streamline your overall organization efforts. Before you start exploring the possibilities of vertical storage options, you’ll want to take some time to familiarize yourself with local building codes and storage codes. Many different states, counties, and so on will have building codes that can affect the placement of any vertical shelving such as distance from heating/ventilation, distance from overhead lights, bathroom availability, and so on. Even if you’ve already placed your shelves and planned to expand vertically, understanding these requirements and limitations will help prevent further storage problems and potential code violations down the road. In a lot of cases, warehouses that look to expand their vertical shelving options tend to just start throwing a lot of tall shelves around and hoping they can use the space to organize everything. While this might sound like a great idea on paper, the truth of the matter is that you can use your storage more effectively by determining what areas need it most. In many departments, like packing and shipping, lower clear heights may be required and you may need fewer vertical solutions as the work being performed doesn’t call for it. This can help you keep things orderly and stop you from installing shelving where it may take room away from something more needed for that department’s job duties. While bulk storage (or keeping items on the provided pallets) may be a necessary option for many bigger items, the continued use of pallets can actually impede your ability to safely store a large number of products. In cases where vertical storage is being implemented, consider eliminating pallets on the lower, more commonly-used racks to ensure easier access to the products contained within. Save the palletized products for the higher, less used shelves to act as bulk or overflow storage (so the stock on the lower shelves can be replenished as needs dictate) and use the lower shelves to store larger groups of individual items without the pallets getting in the way and reducing the overall amount of pure inventory that can be kept on these shelves. A common contributing factor to wasted warehouse space is confusion over what spaces are being used for what purpose. To prevent these issues, any new storage solutions being brought in need to have a defined and set purpose that’s clearly communicated to everyone on your staff. Set some shelves aside for overflow/clearance items, make sure each shelf has a defined inventory limit and guide to what’s being stored there, and work with your staff so that everyone is on the same page. Misplaced items are the bane of any warehouse, particularly when space is at a premium, and taking some preventative maintenance will ensure smoother operations even when the shelves start getting cramped.